Posted on September 20, 2018 by gayle. 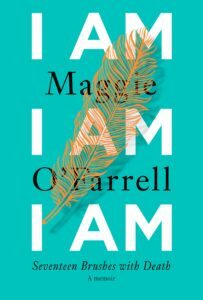 This entry was posted in Audiobooks, Memoir, Non-Fiction and tagged audiobook, i am i am i am, maggie o'farrell. Bookmark the permalink. So glad you mostly loved this one! I loved it too! It’s the first O’Farrell I’ve read and I’m now planning to read This Must Be the Place later this year…I picked it up in a Kindle sale.